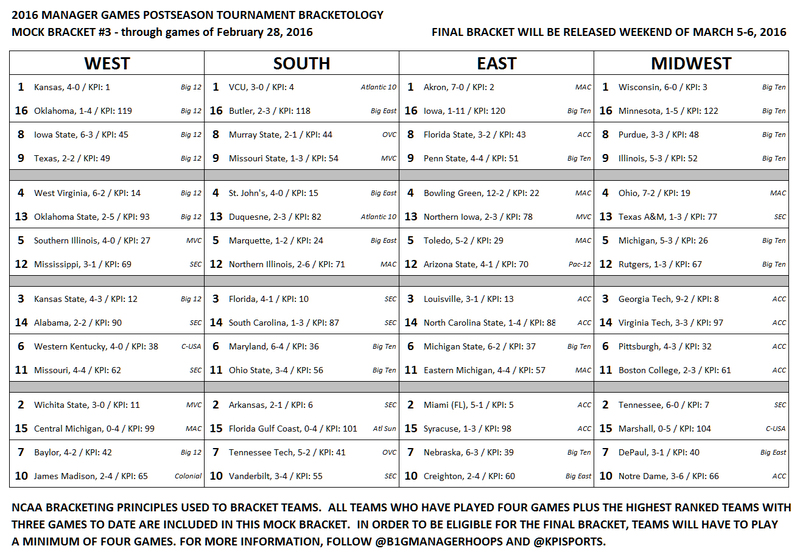 Manager Games Postseason Tournament Mock Bracket #3 (through games of February 28, 2016). There are now 59 teams eligible for the Manager Games Postseason Tournament by having played at least four games. The remaining five teams in this mock bracket are the seven highest-ranked teams in KPI who have played three games. A few teams were moved up or down one seed line in the interests of geography. As a reminder, teams must play four games in order to be eligible for the postseason. Information on the postseason tournament can be found here. If there are not 64 eligible teams, the highest-ranked teams having played three games will fill the field.